Come visit Grimm Ghost Tours where you can visit actual haunted locations and learn of the history behind them. We offer multiple tours to satisfy all your ghostly desires. 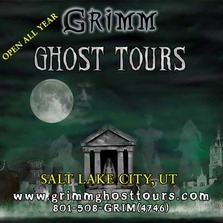 Come join the Old Town tour if you would like to visit some of the oldest buildings in Salt Lake City that are haunted or if want to visit some of the most gruesome sites of the city jump on the Outer Reaches tour when you get to visit haunted locations that only the non faint of heart tread such as Ted Bundy's old house, or the Old Fort Douglas Cemetery where the German victims remain from one of the worst massacres on United States soil during World War II. Each tour lasts an hour and a half and is an interactive tour where you get off at most locations. If you want to take your experience to the next level we offer paranormal investigation where you get to experience what its like to be a ghost hunter for yourself. Some of the stories of Utah's past are not for the faint of heart and we don't recommend it for those under the age of 12. So bring your date and see why we were voted best city tour two years running! Contact Info:To purchase tickets or to find out more information please visit our website at www.grimmghosttours.com We currently have tours on Friday and Saturdays at 7pm, 9pm, and 10:30pm. Visit https://grimmghosttours.com/buytickets.html for a detailed schedule. Utah Kids Club Offer: Get 40% off the normal ticket price by using the promo code "UTAHKIDSCLUB" Super fun date night too!